The Smashing Pumpkins frontman and rookie wrestling promoter talks rock and jocks. Multiplatinum rock star, published poet, spiritual blogger, onetime Jessica Simpson arm candy. 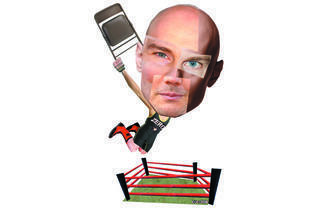 Billy Corgan is tough to pin down. On Friday 25 at Excalibur comes what seems the Great Pumpkin’s most bizarre career move of all: the debut of his indie wrestling promotion RESISTANCE Pro. 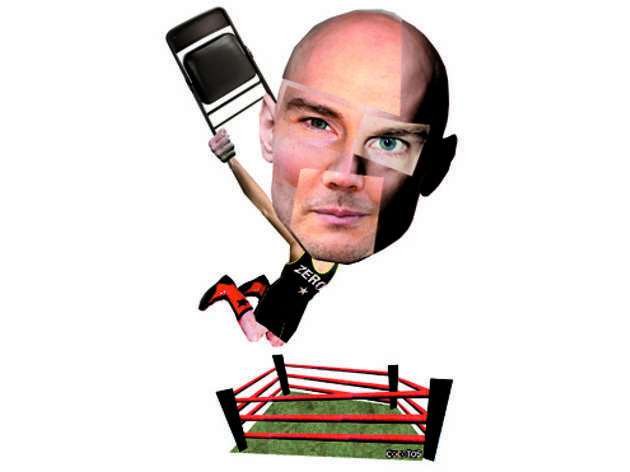 On the phone from the Paris–Charles de Gaulle Airport during a tour layover, Corgan drew comparisons between the worlds of rock and wrestling. What was your earliest experience watching pro wrestling? There was a show on Spanish-language Chicago TV called Bob Luce Wrestling. Luce was the local promoter, and I think he even owned used-car dealerships. [Laughs] Every Saturday, I’d watch these larger-than-life wrestlers. It felt otherworldly, like I was tuning in to another planet. I was really compelled by the insanity of it all. You’re penning all of RESISTANCE Pro’s story lines. What interests you in a wrestling plot? Themes of loyalty and betrayal: At what cost will someone sell out? The guy buddies up to you, and when you least expect it he turns on you because he wants the title—that’s wrestling 101. But there’s a way to do that with more depth. Selling out, backstabbing—that also sounds like rock 101. Oh, I’ve had plenty of that, buddy. [Laughs] That just goes with the territory of being successful. You’ve been criticized for admitting you’re a careerist. Is it refreshing to be in the wrestling world, where careerism is de rigueur? It’s more honest. Indie wrestlers, by and large, will openly discuss that they want to work for the biggest companies. I think people who talk the indie cred game in music are full of B.S. I haven’t found a lot of people who actually live it. Can we look forward to seeing you throw the occasional folding chair? No, someone like me doesn’t belong in a wrestling ring. [Laughs] It would be disrespectful because the people who do it are really well trained and talented. People seemed surprised by your interest in pro wrestling. But a Pumpkins show is not so different: leather outfits, makeup. Wrestling helped me understand success with a crowd. In wrestling, booing is just as powerful as cheering. So I learned that I can work a crowd from positive to negative and back. Unfortunately, most rock audiences aren’t sophisticated enough to understand they’re watching a performance. They feel somehow personally affronted by that back-and-forth stage energy. Someone often affronted by the Pumpkins was former Sun-Times pop-music critic Jim DeRogatis, with whom you’ve notoriously feuded. If every wrestling personality has a nemesis, he’d have to be yours. There were times when I saw him that way. [Laughs] But I’m pretty cool with Jim at this point. He’s superpassionate about music, while most music journalists are just passionate about their opinions. But I think his passions are often misguided. This is the guy who gave my biggest-selling album two and a half stars in Rolling Stone. You’re a die-hard Cubs fan, and you were a devoted athlete as a kid. How ironic that you became a major voice for disenchanted youth picked on by jocks. [Laughs] If you want a portrait of me at 15, I was the guy with the weird hair and the bad attitude that would be made fun of by the jocks—and then I’d go out and dunk on them. Then I didn’t make the high-school baseball team, which is why I started playing guitar. RESISTANCE Pro debuts Friday 25 at 8pm at Excalibur, 640 N Dearborn St. $20.